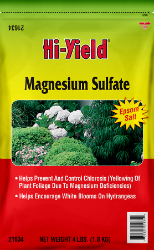 Contains a soluble source of Magnesium that is readily available to aid in correcting plant Chlorosis. Excellent for use on palms. Use to encourage white blooms on Hydrangeas. Soil application: 1 lb. per 100 sq. ft.